Are you looking for an entry-level regulator, that deliver excellent performance and tough as nails? Then the Sherwood Brut Pro should definitely be on your short list. The Sherwood Brut is a time-tested scuba regulator that got a complete makeover, looking nothing like those before it. Although it might look different, the New Sherwood Pro Brut remains true to its predecessors by providing rugged durability and reliability, while being easy to maintain and service. These features have always made the Brut a favorite with entry-level divers, as well as a rental regulator at many dive centers around the world. 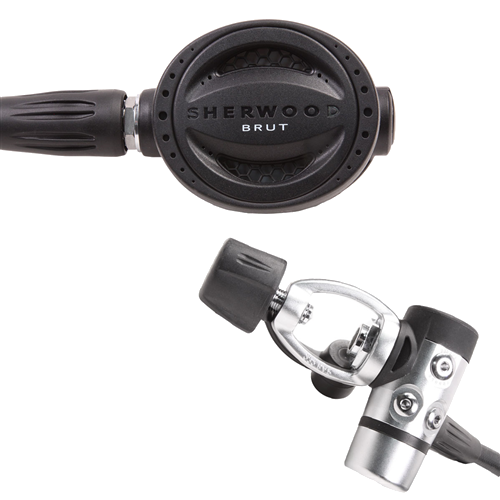 Not only has the New Brut stayed true to it predecessors, but Sherwood Scuba claims it also has a few more features that enhance the performance of an already great regulator. In this Sherwood Brut Pro review, we are going to look at its upgraded features and what makes it a great buy. The Sherwood Brut Pro is a great entry-level regulator that delivers excellent breathing performance at recreational depths and is available at a very attractive price point. What Type of Diver Sherwood Brut Designed For? Below is a video created by the guys over at ScubaLab. In the video, you can get a closer look at the new Sherwood Brut regulator and some of its main features. One of the most obvious changes is the high polished marine chrome on the first Stage. It has been redesigned with a vertical patented dry seal chamber, as opposed to the horizontal design of the previous Bruts, making it less bulky and more streamlined. Although it has been completely redesigned, it still uses Sherwood’s patented dry sealed spring chamber. This keeps the internal mechanisms of the regulator from coming in direct contact with the water and other contaminants, which results in consistent performance between servicing. It has also been upgraded from an unbalanced to a balanced system to deliver consistent performance. So, you should not experience any difference in breathing on deeper dives or on low tank pressure like to old Sherwood Bruts. Instead of using a traditional downstream valve for the second stage it is now pneumatically balanced, making the second stage much easier to breathe from, than previous Bruts. A feature normally found in higher-end regulators. It also now has two high-pressure ports on both sides of the regulator and 4 low-pressure ports for optimum hose position and routing. The first stage heavy and ruggedly built and the second stage has high impact housing making the second stage very durable and rugged – staying true to the Brut name. New design is more streamline and allows for better hose routing. However, the first stage is on the heavy side and not ideal for traveling. The Brut delivers excellent breathing performance, but has no user adjustable setting to fine tune your breathing. Like its name sake, the is built to be rugged and durable. A sealed first stage ensure internal parts are not affected by the environment. Affordably priced for the entry-level market. It delivers breathing performance similar to some mid-priced regulators. At the time of writing this review, the Sherwood Brut Pro received excellent ratings from divers online. Many divers found the Brut to be an easy breather and comfortable to use. For the price, you cannot go wrong with the Sherwood Brut Pro as an entry-level regulator, and it performs just as good as many high-end regulators for a fraction of the cost. The only thing found against the regulator is its heavy first stage which does not make it ideal as a travel regulator or for a pony bottle. We also didn’t like that there are no diver adjustable settings, however, this is to be expected from regualtors in this price range. What Type of Diver Sherwood Brut Pro Designed For? The Shorewood Brut Pro is basically designed for the entry-level divers and makes an excellent choice as a first scuba regulator. Also, because of its rugged design, durability, and excellent breathing performance at recreational depths, it has become the go-to regulator for rental applications at resorts and dive centers. Can I use this regulator for cold water diving? The Brut is not designed for cold water diving. Check out the Sherwood Blizzard Pro. Is Sherwood Brut Pro available in a DIN Version? Can this regulator be used with Nitrox? Overall this regulator has been totally redesigned from top to bottom to deliver better breathing performance than it’s predecessor while still staying true to the Brut’s reputation as being a rugged and reliable regulator that is easy to maintain. If you are looking for a great entry-level regulator, that is Nitrox compatible to 40% right from the box, at an attractive price, and also breaths great, then look no further than the Sherwood Brut. Do you have any experience with the Sherwood Brut Pro, good or bad, please feel free to share in the comments below.